'ANT' ANTIGUOKO K.E. 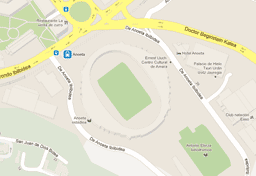 'ARE' ARENAS C.
'ATH' ATHLETIC CLUB 'AUR' AURRERA DE VITORIA C.D. 'DAN' DANOK BAT CLUB DE FIKA DE BILBAO 'DEP' DEPORTIVO ALAVES S.A.D. 'HER' HERNANI C.D. 'IND' INDARTSU C.
'LEI' LEIOA S.D. 'REA' REAL SOCIEDAD S.A.D. 'S.A' S.A.N.S.E. Arrupe Chaminade CDF 'TOL' TOLOSA C.F.